Ever since i went to Germany and ate the amazing pretzels, i've been trying to recreate them at home. Unfortunately i've found that they aren't as simple as initially expected. The first time i made pretzels they were a disaster. They looked terrible!!!! This time things went a little smoother although i probably stretched the dough a little to far so some were too thin and therefore crunchy. One thing you do need when making pretzels is lye. Lye is a very alkaline substance and it gives the pretzels that awesome dark brown, chewy crust. I bought my lye as lye water from an asian grocer as it is used in asian cuisine to make noodles chewy! One thing i still need to perfect is the salt. I don't know what salt they use in Germany but it didn't taste as salty as my salt. I ended up picking off bits of salt as i ate my pretzel! I used a recipe from Braukaiser. This is the recipe i used the second time and i recommend it. I will continue to use this recipe. 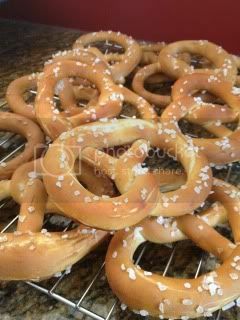 I highly recommend visiting the website as it has step by step pictures and explanations of the art of pretzel making. Weigh the ingredients into a mixing bowl. Using a mixer knead the dough for 10-15 min until smooth. The dough should be stiffer than normal bread or pizza dough. Let the dough rest for a few minutes before portioning to allow the gluten to relax. Portion into 70-80g balls. Take a dough ball and start rolling it into a log. If it is hard to work with moisten your hand a little. As the dough is fairly tough it is difficult to roll it out in one go so you have to work it in stages. First roll them all to about 10 cm then let them rest. Keep rolling and resting until the strands get to 40-60cm in length. On your final roll, make sure the strands are slightly thicker in the centre and thinner on the outside. Let the pretzels rise for 30 minutes. Now it's time for the lye bath. For me this was a bit of guess work. Because i used lye water and not lye powder i'm pretty sure i got the dilution factor a bit wrong. The resultant lye solution should have a strength of 3-4 % by weight. Always add the lye to water and not the other way around. You'll only need about 500mls of solution. Dunk each pretzel in the solution individually, submerging them for about 5-10 seconds (make sure you are wearing gloves!) Place on a baking paper lined tray and sprinkle with coarse salt then cut the fat bit of the dough. Bake them in a 180 C oven for 15-20mins until dark golden brown.